A scant three months and change since my first visit to the Palomar in Philly, I am back near town giving a talk at Swarthmore (in combination with Bryn Mawr and Haverford with just a smidgen of UPenn thrown in for good measure). The drive to Philly was awful on a foggy, rainy day. I-95 was overcrowded. All was well with the world when a way too early to be possible checkin was facilitated by Abby Raymond (Concierge) and her fellow staff members at the Palomar. I dumped off my bag and scooted over to Bryn Mawr in the rain. After dinner, those of us still standing walked two blocks down to Village Whiskey to visit Keith and witness his mixological magic. We started with my old faithfuls the Liberal and a Corpse Reviver #2. Then Keith made us a no-name Bourbon based concoction whose ingredients escape me now (for probably obvious reasons). There was some kind of Amaro with a red label which was neither Averna or Ramazotti. Must return and find out. Stir over ice, serve up with a cherry. Shake with ice. Strain into a chilled cocktail glass with a cherry. Anyway, dinner and drinks could not be beat. 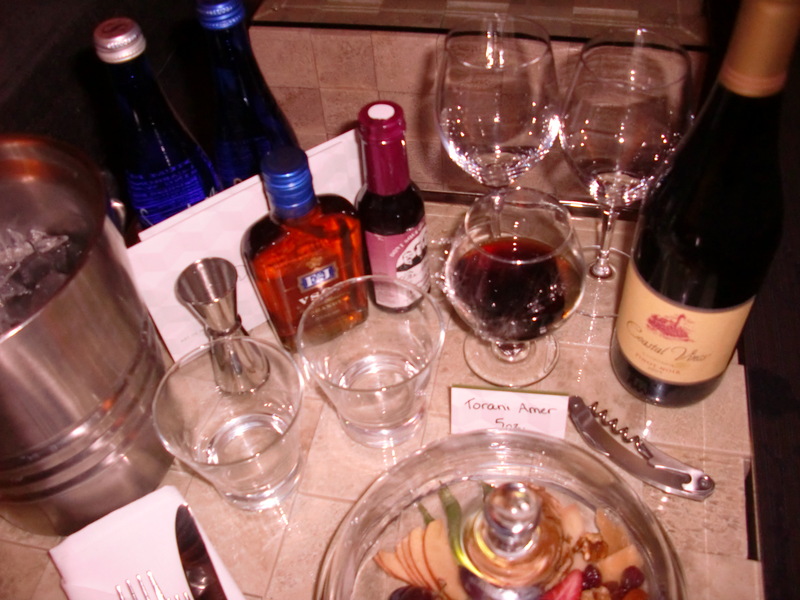 And then when I got back to the Palomar (room 1610 this time), Abby had gathered the very best welcoming package I have ever experienced…all of the makings for a Picon Punch or two. Amazing. The Philly Palomar is great and so is Abby. Five shower heads. Looks like I’ll need to concoct some more reasons to get to Philly! I made a corpse reviver #2 as per the instructions above. i was dubious as I don’t really like gin, but the drink is FANTASTIC. It was so good I had another. The ingredients are easy to come by (found the Lillet Blanc at Total Wine). I now have Torani Amer and Fee Brothers Orange Bitters on order, and we shall see how Liberal I can be.